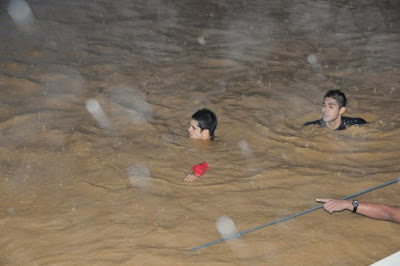 When I learned that Richard Gutierrez saved Christine Reyes who was on the roof trapped by the flood, I was in awe. Wow! Richard Gutierrez used a speedboat to rescue Christine! The news that Richard refused to take in a baby from a father treading flood water, I was flabbergasted. "Pogi" points went down to zero! Then pictures of Jericho Rosales trying to rescue his neighbors using his surfboard (and wearing rashgard) circulated in Facebook. Oh Wow! He really risked his life and safety to help his neighbors. Kudos to Raymart Santiago who was with Jericho too. A young star by the name of Gerald Anderson, swam his way to check out his neighbors too. Hats off to these movie actors. It is really heartwarming and awe-inspiring how some people respond in times of distress. The Filipino spirit of "bayanihan" is alive and well. Ethan spent his birthday attending to his "dad" aka grandpa at the hospital. D4 bought a cake and we ordered food from Ethan's fave Chinese resto. The 7th birthday party was quiet but the obligatory cake-candle blowing was done nevertheless. As we were on our way, we passed by several new housing projects. D2 said we should consider relocating. I said I think it would be better if we just buy a mobile home. We both laughed as we imagine a possible scenario of floating mobile homes. However, wouldn't it be grand if we do indeed own one, parked somewhere safe and dry?